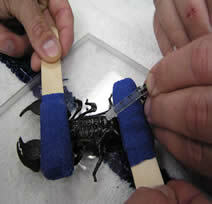 The Zoological Medicine Service has been working to expand medical knowledge of diverse species. 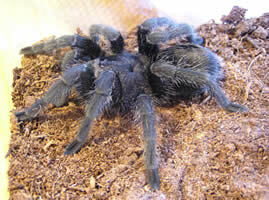 Invertebrates like spiders and scorpions are becoming increasingly popular and valued pets. Many of these animals have lifespans longer than dogs, and benefit from regular health care. We are working toward improving diagnostic testing and therapeutics in these animals to provide quality medicine for invertebrate pets. 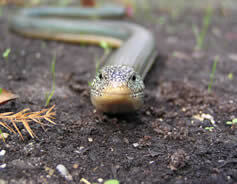 The University of Florida is recognized worldwide as a leader in reptile medicine. Our clinicians have extensive experience with a wide variety of reptiles, from tiny neonatal lizards to giant tortoises and crocodilians. Work at the University of Florida has led to understanding of many of the most important diseases of reptiles, including paramyxoviruses of snakes, adenoviruses of bearded dragons, herpesviruses of tortoises, and many others. 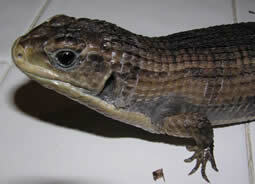 Your pet reptile will receive the best care possible with the Zoological Medicine Service.